Find your style with Kyle's large selection of brown electrical light switches, outlets, and dimmers. Easily add extra plugs, control multiple lights from a single device, or install internet or cable TV jacks. Fast ship. Compare with wall plate finishes below to see before you buy. Before you buy, take a moment to consider new lighting controls that might make your home more convenient and energy efficient. 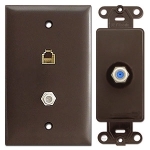 Review the various style and feature options to select the best choices for use with your current wall plate covers or when changing to newer types. 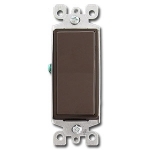 Brown rocker switches vary by brand & sheen. Pass & Seymour rocker switches are dark brown satin. 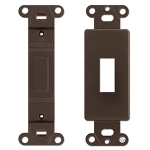 Leviton rockers are glossy and also dark brown. Lutron's are high gloss and have a reddish tint. These will blend the least if mixing devices and brands in a single plate. Brown GFCI receptacles vary by brand as well. 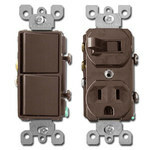 Pass & Seymour's satin GFCI outlet is the best match for a Pass & Seymour's brown rocker switch. Note that the rocker switch does have slightly more shine than the GFCI, even though they're both considered "satin". Leviton's satin GFCI outlet is lighter than the other brands, and has the least shine to it. If you select Leviton's glossy switch and need a GFCI to go alongside it in the same plate, we'd recommend choosing a Pass & Seymour's satin outlet, or one in gloss. 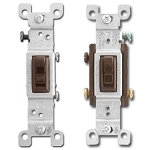 Use our brown device comparison chart to locate part numbers for switches & outlets in both satin and gloss finishes. When updating your home or building an addition, this is the time to review newly available lighting device options. For example, using 3-way switches might make controlling the lights from both ends of a long hall or across an expanded great room more convenient. Perhaps using dimmers will create a more pleasant atmosphere in rooms where new LED lighting fixtures are too bright. Switches for Toggle Plates When shopping for light switches, you have a choice of traditional toggles, modern rocker switches, or dimmers. 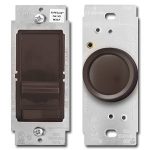 If you are keeping your current wall plates with toggle openings (the small rectangles that are just under 1" high), you certainly can stick with the basic dark-colored toggle, however you might consider upgrading to a toggle dimmer or a rotary dimmer control (maybe even with an attractive decorative knob), both of which still fit into that same toggle opening. Switches for Decora Plates Alternately, you can update with modern Decora switches (the ones with the large square opening just over 2.5" high). Advantages of these contemporary devices include being able to use the same switchplate opening for accommodating most of the new devices, plus the large paddle switches are easy to use. Then you have a choice of dimmers for adjusting lights with either a preset on the side of a rocker or with a wide bar for sliding up and down. Lowering the light level will keep your home cooler while saving you money on your energy bill. Duplex vs. Decorator By the same token, you now have a choice of outlet shapes and functions. The traditional outlet is a duplex shape (the ones with two rounded circles and a single screw in the middle). Even new homes built with modern decor light switches often still use this familiar shape for the receptacles. (Note that horizontal toggles also fit into this stacked shape, and it is not uncommon to find those in older homes.) 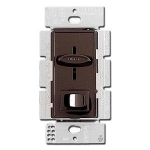 Newer decorator outlets by contrast are rectangular and in fact fit the same openings as rockers and slide dimmers. Outlets, whether duplex or Decora in shape, both can be purchased with a tamper-resistant feature that helps keep kids and the disabled safe. 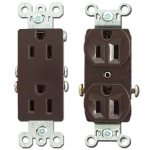 If you are installing outlets near water sources such as in bathrooms, kitchens, or laundry rooms, you will want to choose a ground fault outlet which has the modern shape. 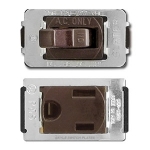 These GFCI's help protect again injury from shock and are required by most local zoning laws. Other devices incorporate USB charging ports. At Kyle Switch Plates you can shop for electrical outlets, light dimmers, rocker & toggle switches by major lighting manufacturers all in one place to make completing your construction job or home remodeling project easy. You'll appreciate the variety of devices and the creative solutions we offer for updating your home or office electrical and communication needs. If you've decided on the metallic dark bronze finish, you may need to get some of your electrical components in brown (such as toggle switches or fan controls), as not all types of devices are available in dark bronze. Here, you can see that the fan controls aren't an exact match, but they can be used next to dark bronze light switches. The finish may be slightly different, too, with some gloss and others satin, however this isn't very noticeable once installed.